The OmniPAGE VS30 unit has been designed to provide a convenient unit for the second stage of 2-D electrophoresis. The 26cm active gel width provides a large gel area to resolve large IEF strips. In combination with the IEF system above, this offers a complete package for 2-D electrophoresis. The unit utilizes the OmniPAGE advanced design features to provide convenient ease of use with high resolution separations. Rapid set up cooling retains resolution in extended separations and also saves on buffer volume without affecting run quality. Four gels can be resolved per run. 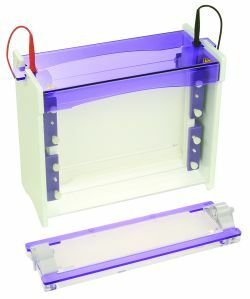 A wide range of accessories is available to allow easy transition between 2-D and standard vertical electrophoresis techniques. In particular different types of 2-D comb allow a wide degree of versatility in sample selection and gel set-up.